I love this dressing! 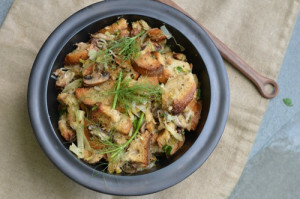 The base starts with toasted rye cubes mixed with assorted wild mushrooms, leeks and herbs. These ingredients combine into this tasty savory dressing, the perfect side to your Thanksgiving turkey or for any of your holiday celebrations. From by the bay wishing you wild mushroom food memories! Preheat oven to 400 degree F. Place bread cubes in a single layer on two rimmed large baking sheets. Bake until toasted about 10-12 minutes. Set aside to cool. In a large skillet add 4 tablespoons butter and saute the mushrooms until they release their liquid and start to brown about 10 minutes. Place mushrooms into a large mixing bowl. Add remaining butter to the same skillet, melt butter and then add fennel, thyme and rosemary, when fennel begins to soften add the leeks. Saute together until softened about 10 minutes, separating the leek rings. Add chili flakes and saute another minute. Remove from heat and add to the bowl with the cooked mushrooms. Add the toasted bread cube, cheese and parsley to the bowl. Add 2 cups of chicken stock. Mix the ingredients together and season with salt and pepper. If dressing is not moist add the additional cup of stock. Mix well. The dressing can be made up to this point one day in advance and refrigerate until ready to bake. To bake the dressing, remove from the refrigerator and let it come to room temperature. Bake in a 350 degree F oven for 30 minutes, until dressing is heated through the top is golden brown. Remove from oven and serve warm. This entry was posted in side dish and tagged leeks, mushroom and melted leek dressing, mushrooms, rosemary, rye bread dressing, stuffing recipes, Thanksgiving recipes, thyme on November 19, 2015 by entertainingbythebay.